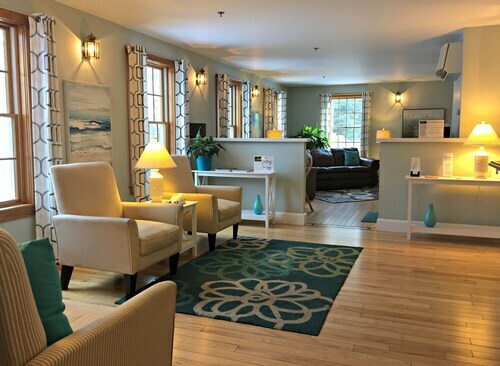 Located in the heart of Ogunquit, this motel is within a 10-minute walk of Leavitt Fine Arts Theatre and Ogunquit Beach. Marginal Way and Perkins Cove are also within 2 mi (3 km). 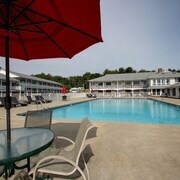 Located in the heart of Ogunquit, this hotel is within 1 mi (2 km) of Footbridge Beach, Ogunquit Beach, and Marginal Way. Perkins Cove is 1.6 mi (2.6 km) away. 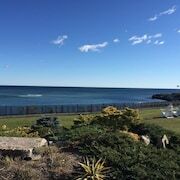 Situated by the ocean, this spa hotel is within a 10-minute walk of Blacksmiths Mall, Ogunquit Beach, and Marginal Way. Perkins Cove is 0.8 mi (1.3 km) away. 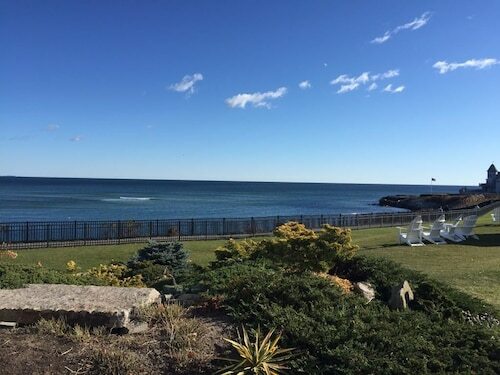 Situated on the waterfront, this hotel is steps from Ogunquit Memorial Library and Marginal Way. Ogunquit Beach and Perkins Cove are also within 15 minutes. 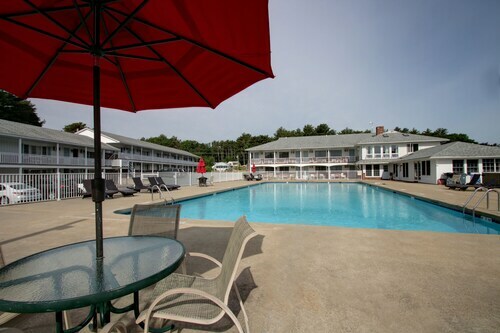 Located in the heart of Ogunquit, this motel is within 1 mi (2 km) of Footbridge Beach and Ogunquit Beach. Marginal Way and Perkins Cove are also within 3 mi (5 km). 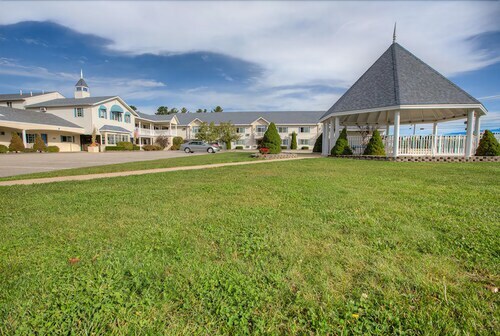 This family-friendly Ogunquit motel is located on the riverwalk, within a 15-minute walk of Footbridge Beach and Leavitt Fine Arts Theatre. Perkins Cove and Kittery Outlets are also within 16 mi (25 km). 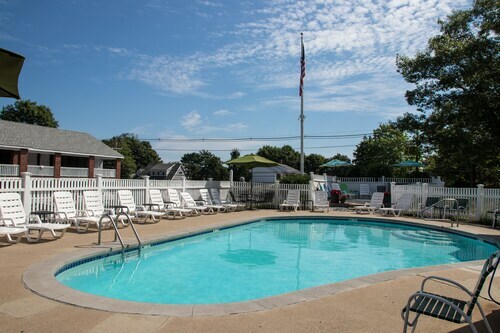 Situated near the beach, this hotel is within 1 mi (2 km) of Footbridge Beach and Ogunquit Beach. Marginal Way and Perkins Cove are also within 3 mi (5 km). 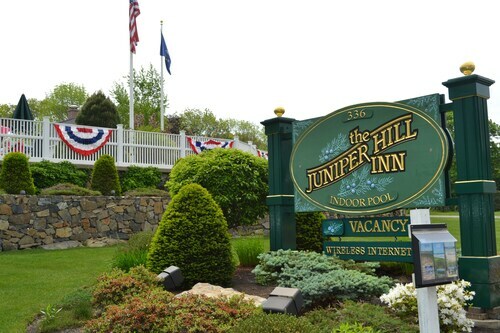 Situated in Ogunquit, this hotel is within 1 mi (2 km) of Footbridge Beach and Ogunquit Beach. Marginal Way and Perkins Cove are also within 3 mi (5 km). 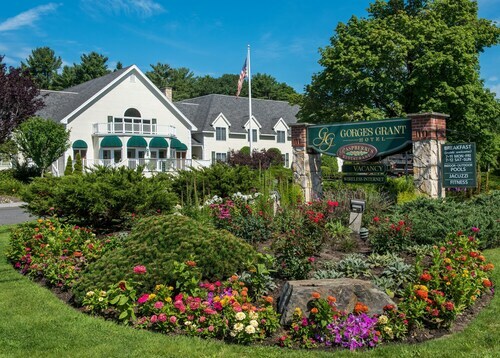 Located in the heart of Ogunquit, this hotel is within a 10-minute walk of Blacksmiths Mall, Ogunquit Beach, and Marginal Way. Perkins Cove is 0.9 mi (1.5 km) away. How Much is a Hotel Room in Ogunquit? 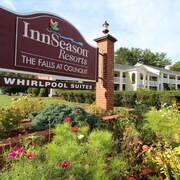 Hotels in Ogunquit start at $65 per night. Prices and availability subject to change. Additional terms may apply. If you are booking exciting lodging options in the Ogunquit area, it's handy to know there is a large range of different options awaiting you. The modern traveler will love finding no less than 51 accommodation options within a stone's throw of Ogunquit's downtown core on our easy-to-use hotel section. 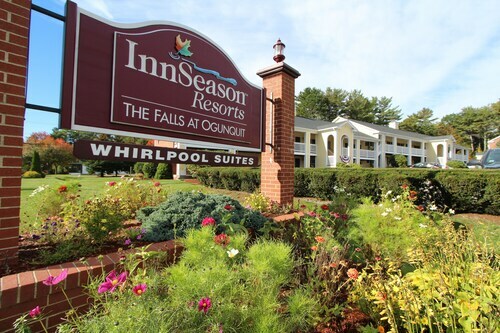 Discovering convenient accommodation a brief distance from Ogunquit has never been simpler. 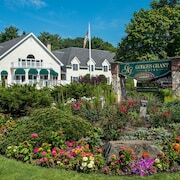 Our comprehensive visitor guide lists the Gorges Grant Hotel and Colonial Village Resort, which you can find within a 0.6-mile (1-kilometer) radius of the city's center. Trying to book budget accommodations? 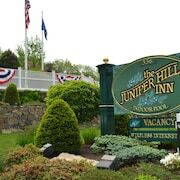 You may like to investigate the The Milestone, Pink Blossom Family Resort and The Ogunquit Inn. 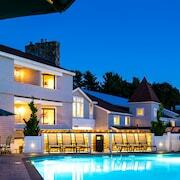 The The White Barn Inn And Spa can be found 10 miles (15 kilometers) from the downtown precinct of Ogunquit. Alternatively, the Hidden Pond is positioned 14 miles (22 kilometers) away. Alternatively, you may like to make a booking at the The Tides Beach Club or the Atlantic House Inn. On your travels, why don't you learn about more of the beaches and coastal plains to be found in Portland - South Coast? Plan to take a few nights in some of the other fascinating parts of Portland - South Coast. Take part in hiking or check out the region's diverse things to see. Many hotel options are located nearby. Kittery is 12 miles (19 kilometers) to the southwest of Ogunquit and is where you'll find Kittery Outlets and Fort McClary State Park. The Sheraton Portsmouth Harborside Hotel and Residence Inn by Marriott Portsmouth Downtown/ Waterfront are some of the lodging alternatives in Kittery. 5 miles (8 kilometers) to the north of Ogunquit, you'll reach Wells, which boasts the Americas Best Value Inn & Cottages and Coast Village Inn & Cottages. The Moody Beach and Wells Reserve at Laudholm Farms are frequented sites to experience when in Wells. Just because you're traveling in Ogunquit - Wells, doesn't mean that you can't indulge in your obsession for sport. You will find Verizon Wireless Arena 45 miles (76 kilometers) to the southwest of Ogunquit. Anybody that hope to find hotels in the area surrounding the game should look at the Hilton Garden Inn Manchester Downtown or the Radisson Hotel Manchester Downtown. Portland International Jetport Airport is a practical arrival point for air travel, and is found 30 miles (50 kilometers) outside Ogunquit's center. Conveniently located hotel options are Fleetwood House Bed & Breakfast and Embassy Suites Portland. This is a great property, plenty of space in the rooms and love the king sized beds. I only wish the bed pillows were bigger. The pool area is immaculate and overall cleanliness is wonderful! Very friendly. Let us check in early due to a snow storm. Loved watching the ocean from our room. The Admirals Inn is a wonderful hotel with the ambience of a bed and breakfast and the comforts of a big hotel. Great location within walking distance of the shops and beach. Beautiful hotel. Nice pool and hot tub. It is close to town and the beach. The staff was friendly and helpful. Nice roomhotel staff very friendly and go out of their way to please you. The only complaint I had was that the housekeeping staff did not leave coffee and the little coffee condiments for the coffee maker every day. My husband went to inquire about this and to get some replacements and was told this was not customary to replace every day! I think I paid enough for the room coffee packets should be provided. 6 months ago by A verified traveler from Plainville Ct.